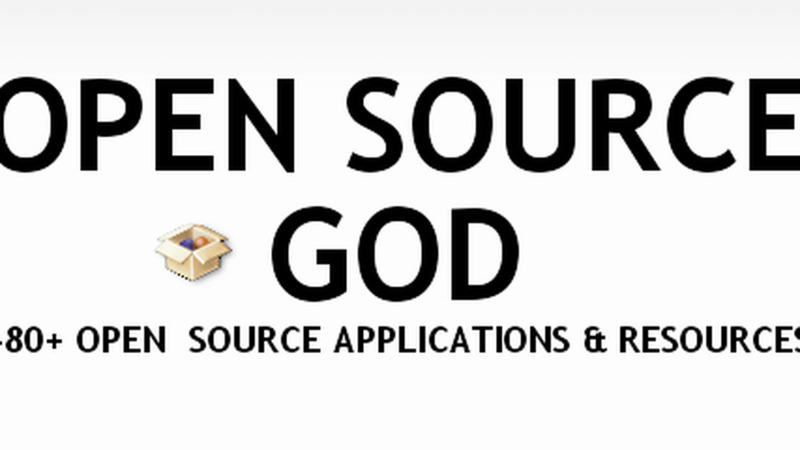 Open source software is booming: here we round up over 480 open source applications for you to use or build upon. Feel free to add more apps in the comments. And don’t forget to subscribe to Mashable for the latest web news and resources. Also see the other entries in this series: ONLINE PRODUCTIVITY GOD, WORDPRESS GOD, ONLINE MEDIA GOD and FIREFOX GOD. Adaptive Planning Express - An open source solution enabling medium sized companies to automate budgeting and forecasting by moving beyond traditional applications like Excel. Buddi - A simple budgeting program for users with no financial background. CheckItOut - A Ruby on Rails application to manage personal money accounts. FrontAccounting - A professional web-based accounting system for ERP chain; written in PHP with use of MySQL. GFP - A free java based personal finance manager with the ability to run on any operating system. GnuCash - Open source financial accounting software to manage personal and small business expenses and incomes. Gnumeric - A free spreadsheet program for the GNOME desktop providing several customization features and import/export facility from other spreadsheet programs. Grisbi - Grisbi is an open source personal finance manager developed to run on any platform and suit the needs of all users. jGnash - jGnash is an open source personal finance manager that will help you monitor and keep track of your accounts, including investments. KmyMoney - Easy to use, accurate open source personal finance manager built to suit the needs of non-technical users. It provides all the features available in a commercial application. Librepos - A multi-user POS application designed for touch screens, customer displays and barcode scanners. NOLA - An integrated, all-in-one package for an organization’s inventory, POS, accounting, contact management, billing etc. TurboCASH - Flexible small business accounting software fulfilling the major needs of any business. 80 + Open Source Content Management Systems - A complete roundup of Open Source CMSs from Mashable. Anteil - Cost effective open source solution for managing and improving customer relationships. CitrusDB - CitrusDB is a PHP & MySQL based open source customer database solution. CiviCRM - The world's first downloadable constituent relationship management system; fund raising software that allows users to manage information about donors, volunteers etc. Compiere - Offers integrated ERP and CRM suite that enables users to automate the financial, distribution and other needs of their businesses. Daffodil CRM - Organized and effective way of managing cost-effective customer relationships. Hipergate - Serving developers, consultants and enterprises to assist them in project management, sales force automation and customer relationship management. IGSuite - A web-based integrated CRM suite that includes solutions like mailing lists, calendar, contact management and task lists. Keen CRM/ERP - An advanced, feature packed, comprehensive customer relationship management solution for small companies. Ohioedge CRM - Ohioedge CRM is an enterprise level open source CRM solution. OpenCRM - OpenCRM is an open source CRM solution for tracking clients and project management. OpenCRX - A cross platform professional CRM solution with bug tracking and activity management features. SellWinCRM - An open source CRM project giving a high level of customization for customers. SourceTap CRM - SourceTap CRM is a flexible sales force automation solution developed to meet the requirements of sales managers and representatives. SugarCRM - An open source CRM solution allowing users to track opportunities and manage existing customers while keeping a check on other activities. Turquoise CRM - Lightweight CRM software built over LAMP with Business Intelligence functionality. Tustena CRM - Tustena is an enterprise level open source CRM solution written in C#. vtiger CRM - Built over LAMP/WAMP, Vtiger provides excellent business enhancement utilities and is compatible with multiple platforms. XRMS CRM - XRMS is an advanced level open source CRM solution that includes a Business Intelligence suite and advanced plugin architecture. bbLean - A new version of Blackbox for Windows. BlackBox For Windows - An alternative shell for Windows that is based stylistically on the Blackbox window manager for the X Window system. Blueberry 3D-Desktop - Made using Delphi; its main objective is a 3D OPENGL engine in replacement of the Windows desktop. CyGNOME - A nice tool which ports GNOME desktop to Windows. DM2 - Provides useful enhancements for Windows in daily work like minimizing windows to floating icons, freeing the taskbar etc. Geoshell - A shell replacement for Windows that replaces the standard desktop interface items like start menu, taskbar, system tray etc. KDE-Cygwin - KDE’s port in Windows desktop environment. LiteStep - A powerful Windows shell replacement under GPL and inspired by AfterStep. SharpEnvironment - A tool that enables users to personalize every pixel of visible space and customize a single theme in multiple ways with real-time wallpaper effects, icon sets etc. Virtual Dimension - A fast and fully featured virtual desktop manager that acts as an enhancement to the Windows manager. xoblite / Blackbox for Windows - An advanced level Blackbox for Windows that is integrated with a system bar. Columba - A java based email client featuring a user friendly graphical interface. Daffodil Organizer - Highly flexible way to organize emails; includes import facility from Microsoft Outlook. Evolution - More popularly billed as the Outlook of Linux, its calendar, address book and other features make it a good option as an email client. ICEMail - Open source java client with support for the latest email standards. Mahogany - Cross platform email client supporting UNIX and Win32 platforms. Mutt - A small and powerful text based email client for UNIX operating systems. Penelope - The open source version of Eudora currently under beta and planned for full release by this year. Phoenix Mail - One of the older open source email clients developed using Borland Delphi. Sylpheed-Claws - An open source email client with an interface similar to Outlook Express; works as an RSS feed reader too. Thunderbird - A secure email client with several customization options to fit the user's needs. Zimbra - Zimbra is currently one of the biggest names in open source, and is the future collaborating and messaging software. Now owned by Yahoo. Alba Extractor - Alba Extractor is a useful utility for wrapping various mp3 files into one unit for ease of sharing on programs like NapShare etc. Audacity - Audacity is an open source, cross platform audio editor and is a good solution for creating and editing podcasts. Avidemux - A free video editor for tasks like cutting and filtering; has support for file types like AVI, DVD etc. AviSynth - A powerful tool for editing and processing videos. BonkEnc - A useful application for ripping CDs, encoding and converting audio files to various formats. Users can produce mp3, mp4, FLAC files to name a few. CD-DA X-Tractor - An open-source CD ripper for 32-bit windows platforms that offers extremely high quality. CDex - A popular open source digital audio CD extractor. DivFix - DivFix is a utility for watching partially downloaded DivX movies. DivXRepair - Based on the VirtualDub model, it cuts off the bad parts and re-assembles the AVI file. Dr. DivX - The goal of Dr. DivX open source project is to create a portable application with the capability of transcoding many video formats. DScaler - The DScaler project is an effort to receive top quality videos from Windows computers. DVD2AVIdg/MPEG2DECdg Decoding Fix - An MPEG decoder suite used for decoding MPEG1 or MPEG2 streams from sources such as DVD VOBs. DVDx - Popular DVD backup software that converts DVDx movies to high quality DVD movies. FFmpeg - A complete recording, conversion and streaming solution for audio and video. GiantDisc - GiantDisc is an open source software package designed to manage thousands of audio tracks. GNUMP3d - Open source server for streaming mp3s and media. Gordian Knot - Gordian Knot is an integrated Bit rate calculator package tool for Divx/XviD encoding. GramoFile - A CD recording utility running on Linux and some other operating systems like UNIX. It enables users to put sounds from gramophone records on CD. HGRip - A one click solution for converting DVD to XVID files. JMAC - JMAC is an open source Java implementation library of Monkey’s Audio compression decoder. LAME - LAME is an MP3 encoder. Mixere - Mixere is a free, open-source application for mixing audio files. It runs on Windows NT/2000/XP, and supports WAV, AIFF, MP3, Ogg Vorbis, FLAC and Mod audio files. MMConvert - A multimedia format converter useful for converting media files from one format like AVI/WMV to another format. mpgtx - A command line MPEG audio/video toolbox useful for joining audio and video files which include MP3, MPEG1, MPEG2 etc. Mp3splt - A terrific utility to split MP3 and Ogg files from anywhere without decoding. Mp3Wrap - A useful alternative to wrap two or more mp3 files into a single large mp3 without the loss of file names and other information. Musepack - A high quality audio compression format. MusicBrainz Tagger - Provides a database to create a comprehensive music information site. It can be accessed via the client or the internet. NanDub + BRC - NanDub+BRC includes a bitrate calculator and offers users several advantages as their need for opening separate pieces of software is eliminated. Open Sound World - A scalable programming environment allowing musicians, researchers and sound engineers to process sound. OptimFROG - OptimFROG is a zipping utility for audio compression programs; used to reduce the size of audio files. ShrinkTo5 - A cross platform open source DVD copy engine; allows users to create copies. SmartRipper - A useful utility for extracting DVD VOB files; loaded with nice features for splitting VOB files, angle processing etc. Taksi - Taksi allows users to take screenshots and record videos of favorite games and 3D-graphics applications. Virtual VCR - A compact video capture application designed to work with TV tuner and video capture cards. WavPack - WavPack is a high quality audio compression format and provides lossless compression. YAAI - One of the best tools to display information about AVI files; enables users to see data like framerate, used codes, author information etc. ADempiere Bazaar - Adempiere is a community for open source developers contributing improvements of various applications like Compiere, Helpdesk and Supply Chain etc. JERPA - JERPA is a Java based advanced level architecture model for ERP software. JFire - An exchange platform including ERP, CRM and accounting written in Java. Openbravo ERP - A web based ERP for small and medium enterprises; built on proven MVC architecture facilitating code maintenance and customization. opentaps - An open source ERP and CRM suite including eCommerce, inventory, warehouse, ledger etc. Postbooks - A fully integrated ERP solution for small and medium businesses; features a graphical client which runs on Linux, Mac and Windows. Plazma - Plazma is a Java based ERP and CRM solution. Sequoia Open Source ERP - The flexible ERP software from Sequoia brings advanced features and scalability for enterprise software along with low TCO. Tiny ERP - Packed with features like GTK2 client, distributed server, dynamic GUI. Value - Value is an open source ERP/CRM system and features modular capabilities along with seamless integration. webERP - webERP is flexible integrated business management software that covers accounts receivable, accounts payable, inventory management and other accounting requirements. Wyatt - Wyatt is a cross platform ERP package written in Java with J2EE compliance. ABC - An enhanced client for the BitTorrent file sharing protocol. Ares - A file sharing utility enabling users to share digital files like images, audio, video, software and documents. Azureus - Java enabled BitTorrent protocol packed with special features for beginners and advanced users. BT++ - An advanced version of the BitTorrent peer-to-peer file sharing protocol with cross-platform support; written in Python. Cabos - Cabos has an intuitive user interface and is a Gnutella file sharing program based on Limewire. CoreFTP - A FTP program that enables uploading/downloading/deletion of files and directories, integration with browser, file permission handling etc. cURL - A command line utility allowing file transfer via FTP, LDAP etc. Users can also use the GET and PUT methods for file downloading and uploading. Cyberduck - An open source FTP client with support for drag and drop, uploading and downloading, remote file transfer etc. DC++ - Windows based open source client for unrestricted file sharing over the internet. eMule-Project.net - A reliable and trusted peer-to-peer file sharing application allowing users to connect from different clients. FileZilla - FileZilla is a free, fast and reliable open source FTP solution for Windows. Freenet Project - A free and secure decentralized network of information publishers and consumers. FrostWire - A completely open source peer to peer client; features community chat room and iTunes integration. Fugu - An open source graphical front end for secure file transfer; provides support for Mac operating system. G3 Torrent - A BitTorent client written in Python. Gnucleus - One of the oldest Windows based open source peer to peer file sharing clients related to Gnutella. HeavyMole - An advanced level peer to peer file sharing application with features like distributed chat, filtering of answers and advanced query language. iFTP - i.FTP is a Windows FTP client that comes with source code. There is also an earlier version for BeOS that works with portable media like USB keys. JFtp - JFtp is a graphical Java network and file transfer client. KazaaSearch - Search for music, software, images & video with this powerful peer to peer file sharing client. KCeasy - The windows version of giFT filesharing system that also offers support for other filesharing networks. Krimpy - An IRC based (internet relay chat) open source file sharing client enabling users to share music, pictures, videos and other files. Lime Wire - A multi-platform Gnutella file sharing client enabling users to share their files, download MP3s and other audio files. MLdonkey - 100% open source cross-platform P2P client running on Linux, UNIX, Windows and Mac. MUTE - A secure, peer to peer file sharing network with easy search and download functionality. MyNapster - Comes with connection capability to Gnutella for file sharing, IRC for chatting and supports resumption & multithreading of downloads. NetMess - Has the ability to detect clones and work through HTTP proxy and firewalls. Prozilla- An open source Linux download accelerator that provides download support via HTTP and FTP protocols. Shareaza - A flexible file sharing system consolidating features from four different networks: EDonkey2000, Gnutella, BitTorrent, Gnutella2. TAC2 - Expanded as Tango & Catch 2 (TAC2), works as a search engine independent client for searching on Linux and Windows. TorrentSpy - Gives BitTorrent power-users all the information in one place along with real time ability to monitor the number of live users. Waste - Secure collaboration tool allowing idea & data sharing between users through a chat interface. WinSCP - Another open source SFTP & FTP client for Windows; provides safe file copying between local and remote computers. XNap - Written in Java, XNap provides a plug-in enabled framework and client for P2P applications. Ajax Image Editor - Open source image editor using PHP. ArgoUML - ArgoUML is a popular open source UML modeling tool compatible with any Java platform. Avidemux - A simple video editor with support for DVD/DivX conversion and editing. Blender - 3D animation and modeling suite with various tools for modeling. Bluefish - A powerful editor for programmers and web designers enabling them to write websites, scripts and programming code. BRL-CAD - An open source CAD system centered on constructive solid geometry (CSG) modelling. Cinelerra - A professional open source video editing tool with features for capturing, editing and compositing. CinePaint - Professional graphical editing application targeted towards the movie industry. Cornice - Cross platform image viewer initially developed for Linux; similar in functionality to ACDSee. Dia - Open source drawing tool for UML diagrams, similar in functionality to ‘Visio’. Flowchart Studio - Allows the user to draw a flowchart through graphical editor. F-Spot - A feature rich personal photo management application for GNOME desktops. Gaphor - Simple modeling environment that enables users to create intuitive UML diagrams for documentation purposes. Gimp - The oldest, and most famous, open source graphic application with over 100 plug-ins and powerful paint tools. Gimpshop - Gimpshop changes menus and dialogs in a manner similar to its competitor, Photoshop. GQview - A lightweight image viewer with easy navigation, zoom and thumbnail preview features. i.Mage - i.Mage is a handy graphics editor featuring easy pixel & image editing. ImageMagick - Allows for the creation, editing and composition of bitmap images. imgSeek - imgSeek is a photo management and viewing application with search support. Imgv - An open source, feature rich image viewer providing support for a variety of image formats. Inkscape - An open source vector graphics editor similar in functionality to Illustrator. It provides support for all drawing features like any commercial product. Inquisitor - A fast visual web picture ripper, downloader and offline browser. Jahshaka - Powerful open source movie editor with real time media playback and visual effects. Karbon - Part of the open source KOffice suite, makes a great choice as a vector drawing application. Kino - An open source non-linear video editor that comes with easy importing of DV video and provides video and audio transition effects. khtml2png - A command line utility for creating PNG and JPEG images out of web pages. Krita - An open source image editing and painting program with advanced features. KToon - 2D animation toolkit with focus towards animation industry. NVU - A complete cross platform web authoring system which makes it very simple to create web pages and manage a website without any technical expertise. OpenLaszlo - An excellent development environment for web applications as it can generate Macromedia and AJAX files for webpage use. Paint.NET - .NET based open source bitmap application with an intuitive user interface for drawing and editing. Page Scavenger - A simple Windows application useful for downloading images from free hosting services via webpage links. Pixie - Open source RenderMan renderer. Potrace - An open source project useful for converting bitmap images to raster or vector drawings. QCad Community Edition - A simple, easy to use open source 2D CAD application. Quanta Plus - A feature rich web development environment. Seashore - A basic open source image editor with simple functionality and features. Scribus - Open source cross-platform desktop publishing application. Skencil - A flexible open source, interactive vector drawing application for illustrations, diagrams and other purposes. Synfig - An open source 2d vector animation program for artists to assist them with making cartoons. UFRaw - Unidentified Flying Raw is an open source photo converter that can be used as a standalone application or as a plug-in. VirtualDub - An open source video capture and processing utility with basic features. Violet - Violet is an easy to learn and use open source UML editor. Xara Xtreme - Powerful, general purpose graphics application for Linux and other UNIX platforms. AlsaPlayer - AlsaPlayer is a new type of PCM player for Linux/Unix featuring fully pluggable framework for various media types. Amarok - Audio player for Linux. Cog - Quite often referred to as a potential iTunes alternative; an interesting open source audio player with support for various formats. Coolplayer - A fast audio player for the Win32 environment. Delphamp - Delphi based open source media player. Like a Winamp clone, also features support for Winamp skins. DigitalDJ - DigitalDJ is a front-end MP3 player based on SQL. It can create playlists and manage CD databases in MP3 format. Foobar2000 - Advanced level Windows based audio player with support for Unicode and popular audio formats. Gamp - Gamp is a Gnome audio player written in C and includes support for MP3, Ogg, vorbis etc. Grip - Grip is a CD-player and ripper for the Gnome desktop, and features an automated front end for MP3 encoders. Guliverkli - Its interface is similar to Windows media player, however it also offers advanced features like switching of audio streams in mp4 files. HelixPlayer - An open source media player for various operating systems like Linux, Solaris and Symbian. Juice - Juice is a premier podcast receiver and allows users to capture and receive podcasts anytime. Media Player Classic - An advanced version of Windows Media Player 6.4; offers features like real time zoom, support for AVI subtitles and support for QuickTime and Real video. Mixxx - An open source DJ mixing tool, very useful for professional and amateur DJs. Miro - The only video player which provides you with the option to download YouTube videos, play video files and play live Internet TV. MPlayer - Written in Python; one of the best media players under the GNU-GPL license. MP3Gain - MP3Gain assists users by normalizing the volume of mp3 files; it also does statistical analysis to determine the loudness of a file to the human ear. musikCube - MP3 player based on embedded SQL database engine and packed with innovative features. NotifyCD - NotifyCD is a small system tray based CDDB supporting CD player for Windows 9x/NT/2000. OggPlay - OggPlay is an open source audio player for smart phones. Plainamp - Plainamp is an open source media player for Microsoft Windows. SnackAmp - A music player running on multiple platforms; features a web server and powerful playlist. Songbird - Songbird is a multi-utility open source application; acts as a desktop web player, a jukebox, and a web browser. SysTrayPlay - Also known as STP, ths is a small MP3 player program with a grey button in the taskbar that occupies very little memory. VLC media player - Highly portable cross platform multimedia player & streaming server with support for variety of audio and video formats. Vorbis.com - Open source professional audio encoding and streaming technology. XboxMediaPlayer - XboxMediaPlayer is an open source multimedia player from Microsoft useful for viewing various video/audio/picture files like VOB, AVI, MP3 etc. xine - Xine is an open source multimedia player for playing CDs, DVDs and streaming multimedia over the internet. Zinf - Powerful and effective audio player for Linux and Windows. Supports various file formats such as MP3, Ogg and WAV and also features a download manager and a music browser. Adium - Mac OS X open source instant messaging client that aggregates the popular IM networks. aMSN - MSN Messenger’s open source clone for Linux users. Ayttm - Ayttm is an instant messaging client with all-in-one chat functionality for major instant messaging services. Coccinella - A Jabber client with integrated whiteboard features; includes features like file transfer, multi-user chat etc. Kopete - Part of KDE desktop; a wonderful instant messaging application with voice and video capabilities. Gaim - A very flexible instant messaging application compatible with Linux and Windows offering support for AIM, ICQ, MSN, Yahoo and others. Ineen - Ineen is a feature loaded open source audio and video conferencing desktop tool. IRSIM - Uses PHP and mySQL and provides interaction with multiple messaging clients. Java Jabber Server - A nice open source Java implementation of Jabber instant messenger. Kopete - Kopete is a flexible instant messenger and multi protocol system with support for AIM, Yahoo, IRC and MSN. Licq - A C++ based multi-threaded ICQ clone; uses an extensive plug-in system. MIMP - Mobile version of IMP; functionality includes mailbox viewing, message viewing, deletion or composition of new messages. Miranda IM - Fast and handy multi-protocol messenger for Windows. Openfire & Spark - Real time cross-platform IM client and server based on Jabber protocol. Pidgin - Covers multiple protocols including AIM, ICQ, MSN, IRC, Jabber etc. PlanetaMessenger.org - Java based open source instant messenger offering plug-in support for various IM networks. Psi-im - An open source instant messaging client developed for Jabber. Has communication capabilities with AIM, MSN and ICQ etc. SIM-IM (SIM Instant Messenger) - Free software package providing plug-in based messaging with support for various protocols. Spark - Open source instant messenger with integrated support for group chat, telephony and security. TjK - A portal based open source version of AOL Instant Messenger, originally developed for UNIX users. Tkabber - Open source client for Jabber instant messaging and works on many platforms e.g. Linux, Windows and Mac etc. WengoPhone - WengoPhone is a popular VOIP soft-phone client for making free PC-to-PC calls over the internet. XChat - An IRC chat client for both Windows and Linux. Yafumato Web Messenger - A web-based open source client allowing users to connect to AIM, Gtalk, MSN and Yahoo. CC PDF Converter - Enables users to convert Word, Excel, IE and any other file formats to PDF. Evince - Evince is a document viewer with support for multiple document formats including PDF. Jarnal - Jarnal is an open-source application enabling annotation of a document. okular - A universal document viewer based on KPDF for KDE. PDFCreator - Create PDF files from just about any Windows utility. PDF Download - A Firefox extension for improving your surfing experience. A click on a PDF file link enables you to view it inside or outside Firefox. Pdftk - Pdftk is a command line utility allowing users to merge PDF documents, split PDF documents and do many other things. qvPDF - Windows based PDF creator implemented as a printer driver. Sumatra PDF - A simple and fast application to view PDF files. Xpdf - An open source PDF viewer for the UNIX operating system. Also works under Windows as a command line tool. Aethera - Aethera is a PIM application with communication features like send/receive email, send/receive tasks and appointment requests etc. Chandler - Turns your inbox into a task list. KAddressBook - An address book application for the K Desktop environment. Kontact - Supports news, email, calendars, to-do list; a personal information manager for KDE. KOrganizer - A personal organizer of the KDE desktop environment; has the ability to manage calendars and to do list. Nag - Nag is a task list manager for multiple users and allows them to create many task lists which can be shared between users and groups. OneOrZero - Easy to customize cross platform, enterprise level task management and help desk solution. OpenSync - Open source synchronization framework for managing PIM data such as contacts, calendar, tasks and notes. PTM - An open source time tracking tool. Task Blocks - A simple task scheduling application to ensure that user tasks do not overlap. Task Coach - Task Coach is an open source personal task manager providing features to deal with complex tasks. TaskFreak - Simple web-based task manager written in PHP. Total Text Container - An open source information manager; stores notes, passwords, images, calendar events etc. Achievo - Easy to use and customize open source web-based project management application for business environments. AgileTrack - Java based application for monitoring and tracking activities in a software development environment. ASTS - A set of web based management tools for recording project activities and tasks. Austin - A command line utility for manipulating project timelines in XML. dotproject - Open source Project Management application developed and supported by a group of volunteers. Double Choco Latte - A basic project management application used to track the history of work orders, projects, accounts etc. eHour - User friendly web-based tool for keeping track of time based activities; ideal for consulting companies. FreeMind - A mind mapping application useful for brainstorming sessions. FUTURe - A time management application for individuals and groups. Ganttproject - Written in Java, and using XML file format; enables project planning through a Gantt chart. JIRA - JIRA is a project management & task achievement application for making team processes easy. jxProject.com - Cross platform project management tool with sharing options. IPM - A simple project management application built in PHP4 and requiring Apache 1.3x and MySQL. Memoranda - For users handling multiple projects on a daily basis Memoranda is an ideal tool. NetOffice - An online project management application for managing tasks, projects, team tracking and collaboration between teams. Open Workbench - Excellent Windows-based application providing project scheduling functionality for enterprise users. Planner - Project management tool for the Gnome desktop that is useful for project scheduling, planning and tracking. phpCollab - An open-source internet-collaboration tool for project teams allowing them to share information amongst each other. project-open - A web-based project management system for small consulting and service companies. Covers sales, project planning, collaboration and CRM. Projectory - Projectory is an open source web based project management tool for tracking software projects through development phases. Projman - A project management tool for reading project descriptions and their scheduled tasks. Rapla - Highly configurable event and resource management application primarily targeted towards universities. Taskjuggler - A powerful tool with redefined approach towards project planning activities, taking it far beyond the commonly available tools for Gantt charts. Trac - Wiki and issue management system for software development projects. TrackIt - An open source web based project tracking tool to maximize flexibility and customization. TUTOS - Organization management tool for satisfying the requirements of small groups, teams and departments. User Story .NET - A tool for extreme programming projects in user story tracking. WebCollab - An easy to use collaborative project management system enabling users to work together. WebPBC - Web-based project management tool for small businesses to do budget allocation of projects. XPlanner - Another web-based project management tool for eXtreme programming (XP) software development practices. BIRT Project - An Eclipse-based reporting system. DataVision - A reporting tool that works with any database and generates customized reports. Jasper Reports - A leading open source reporting engine delivering rich screen content and printer into various file formats: PDF, HTML and XLS etc. JERT - JavaEye Reporting Tool is a web-based database reporting tool with sharing features. It enables users to create flexible reports without any programming knowledge. iReport - iReport is an easy to use visual report builder designed and written purely in Java. openi.org - Pronounced as "open eye", this is a web-based open source OLAP reporting tool enabling organizations of different sizes to manage and organize their data. OpenSMART - Similar to Tivoli, a monitoring and data reporting tool for servers. Pentaho - Open source business intelligence tool enabling organizations to operate more effectively by providing reporting, analysis, workflow capabilities. Rapid - I - Offers all types of data mining services (from analysis to customization) helping customers to improve their profitability and efficiency. xTuple - Open source SQL report writer compatible with Windows, Linux and Mac. Aggie - Aggie is a desktop based open-source news aggregator that downloads the latest news in a webpage. AmphetaDesk - A cross platform, open source news aggregator that downloads news items on the user's desktop. BlogBridge - A powerful and flexible desktop based open source feed reader for Windows, Linux and Mac. BottomFeeder - RSS news aggregator client written in Smalltalk and compatible with Linux, Windows, Mac and Solaris. Gregarious - A web-based RSS/RDF/Atom feed reader designed for users to run on their own web server. JRssReader - A fast, Java based RSS & RDF reader; offers compatibility with multiple platforms. NewsFeed - Flexible RSS/RDF/Atom aggregator for different operating systems like Linux, MacOS and FreeBSD. NRss - an "open source Microsoft .NET Framework / Mono class library for reading a RSS feed into a tree of objects mapped to elements in the RSS feed." RSSOwl - Java-based open source news reader. Syndirella - Syndirella is an open source desktop information aggregator providing a user friendly environment for reading information from multiple sources or feeds. ThinFeeder - Very powerful and tiny open source aggregator for RSS/Atom developed in Java language. 7-Zip - High-compression open source archive utility for Windows with support for 7z, ZIP, GZIP, TAR files etc. Amanda - Network backup solution. Bacula - Set of open source computer programs for managing network backup system for Linux/Unix, Mac and Windows clients. BiGZip - Free compression utility based in Java. Burn - An open-source CD and DVD burning application allowing users to create audio, data and video disks in different file formats. CamStudio - Open screen casting application allowing users to capture audio and video and store it later for playback. CDRDAO - Open-source tool with advanced features for recording audio or data CDs. coLinux - Cooperative Linux allows users to run Linux parallel to Windows on any machine. Cream - An open source text editor with interactive user interface, pull-down menus etc. G4U - Open source cross-platform hard disk image cloning application. GrenEye - A file slicing and compression utility. GNU zip - A compression utility. GParted - Fantastic open source partition manager with direct boot facility option from CD or USB. Handbrake - A multiplatform DVD to MPEG-4 converter/ripper with ability to process unencrypted and whole DVD files. InfraRecorder - A freeware CD/DVD burning application for Windows. Info-ZIP - Provides high quality, portable versions of zip files compatible with DOS. Inno Setup - Another open source installer for Windows applications with integrated Pascal scripting engine. InstallJammer - Useful for creating self-contained cross platform installation packages. jEdit - A cross platform open source text editor written in Java with consolidated features from major editors. Emacs - An extensible, customizable, self-documenting open source text editor. K3b - An open source application for creating/burning CDs and DVDs; packed with features like DVD encoding, copying and audio CD creation. Launch4j - An open source wrapper for jar files that supports Mac, Linux and Solaris. Nagios - An open source network monitoring service for hosts, networks and services which use plug-ins. NeDi - Open source network discovery, inventory & management framework utilizing scheduled discovery for network examination. Notepad++ - An open source alternative to Microsoft Notepad with features well suited to development and design. NSIS - A flexible open source tool for developing Windows installers. Open-source ARJ - A cross-platform open source implementation of the popular ARJ archiver. OpenNMS - A network management platform for monitoring services and their hosts. OpenVZ - A terrific alternative to any commercial visualization offering; offered only on Linux. Pandora FMS - Complete network and node monitoring solution composed of three parts: agents, server and console. Partition Image - Disk cloning Linux utility helping users to create an image of partitions. The image file can be compressed, split and it is compatible with Linux and Windows. SciTE - An open source text editor enabling developers to edit code. UPX - A high-performance packaging utility with a high compression ratio for different executable formats. VirtualBox - A high performance, feature rich, open source visualisation product for enterprise as well as home use. Wireshark - Top quality network protocol analyser enabling users to capture LAN packets. Xen - A high performance open source enterprise visualisation solution. Xming - X-Windows server for Windows; has all the features of a commercial product. Xvidcap - Linux based screencast application allowing users to capture portions or the entire screen of a Linux desktop. Zenoss - A top class network and system monitoring solution with all the features of a commercial monitoring system. Zzip - A compression tool with the ability to compress files with a high compression ratio. AbiWord - Has an interface that is very similar to Microsoft Word for easy migration; also allows importing and exporting from Microsoft Word. Agnubis - The PowerPoint of GNOME; comes with easy integration options with other packages in GNOME office suite. Andrew User Interface System (Andrew) - A popular graphical user interface system integrated with word processor, an html editor and browser. AxPoint - Presentation tools from the developers of Apache AxKit. Bruce - Presentation tool for Python programmers allowing them to code and create interactive PowerPoint sessions. Imposter - Imposter is a standalone viewer for viewing presentations created by Impress software. Impress - Fantastic tool for creating multimedia presentations with 2D and 3D effects. Kivio - A part of KOffice suite; helps users in flowcharting, network diagrams and other graphics needs. KPresenter - The presentation package bundled with KDE project; powerful and fully featured. KWord - A word processor with a frame-based layout capability; part of the open source office suite KOffice. MagicPoint - A presentation tool based on X11; very useful for making simple presentations which can be easily edited by any text editor. NeoOffice - A special version of OpenOffice for the Mac. S5 - A simple slideshow system having easily accessible markup. It can easily adapt to user themes and enables you to create your own slideshow themes. WebHuddle - An open-source web conferencing and presentation tool with support for VOIP, chat and PowerPoint. Browser3D - An interactive web browser enabling users to interact with a real 3D environment and add their own 3D environment. Camino - The functionality and features of this powerful browser match the capabilities of Safari. CxBrowser - A useful open source web browser implemented under Mozilla Activex control component and written entirely in C#. Epiphany - Developed for the GNOME computer desktop; competes with KDE for Linux. Galeon - The first web browser for GNOME computer desktop; now comes as an extension to Epiphany. K-Meleon - Perfect web-browser for operating systems which are incompatible with Mozilla or Firefox suite of browsers. Konqueror - Part of the K Desktop Environment (KDE); a great browser for Linux with similar features to Firefox. Lynx - Cross platform browser compatible with UNIX, Windows and Mac. Mozilla Firefox - Fast, powerful and secure web browser compatible with Linux and Windows.